I was at Damansara Heights for work and met up with rif for lunch (since he was also there for work). He took me to All About Mee claiming that they serve pretty good food. I thought that silly boy had lost his mind for suggesting that place to eat. He ordered a bowl of Curry Laksa (RM 6.90) for me while he stuck to his usual Thai Chicken Rice (RM 6.90). 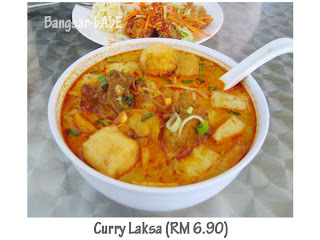 The curry laksa was actually pretty decent. The broth was spicy and thick which I was quite happy about. The sambal was…bleh. But the laksa tasted pretty good on its own. For RM 6.90, it was quite a big portion with a generous amount of taufu pok, fish cakes and chicken. rif’s Thai Chicken Rice was also not bad. The de-boned chicken thigh was nicely fried till crispy and golden brown. Topped with sweet gravy and pickled vegetables, it got rif hooked to ordering it whenever he eats there. Final verdict? Not something you would purposely drive down for but worth trying if you happen to be around that area. 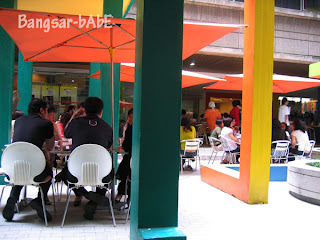 Besides, there’s nothing interesting (or cheap) to eat at Pusat Bandar Damansara apart from mamak and roadside vendors. Lunch cost RM 15.30 including one drink and no tax. Verdict: Worth trying if you’re sick of mamak and don’t feel like clogging your arteries with McDonald’s. 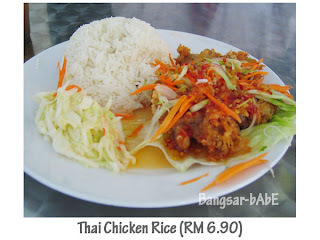 I love the thai chicken rice there but at times the chicken can be on the fatty side. The nasi lemak there is also a hit. Note that it is one of the first to be sold out.